Mumbai: India’s benchmark Sensex rose to a record high on Thursday, but only a few investors have reasons to be happy. A handful of stocks, including Tata Consultancy Services Ltd (TCS) and Reliance Industries Ltd (RIL), have powered the gains in the benchmark stock indexes. The BSE mid-cap index, in contrast, has dropped 12.74% year to date and the small-cap index has declined a steeper 14.62%. Shares of TCS and RIL have gained as investors focused on June quarter earnings, but worries of an all-out global trade war, firm oil prices and a stronger dollar continued to weigh on sentiment, as reflected in the poor performance of the broader market. For now, investors have shrugged off concerns related to a new list of Chinese goods that may be subject to additional tariffs by the Trump administration. “It (the gains) may not sustain," said Gautam Chhaochharia, head of research at UBS Securities India Pvt. Ltd. “The macro concerns are still hovering. The trade war worries are big. Oil and currency haven’t seen respite either." Crude oil prices are still around $75 a barrel, while the Indian rupee touched a record low of 69.09 against the dollar on 28 June. In intra-day trading on Thursday, BSE’s 30-share Sensex rose as much as 433.6 points, or 1.2%, to a record high of 36,699.53, while National Stock Exchange’s 50-share Nifty rose as much as 1.19% to 11,078.30, the level last seen on 1 February. Sensex closed 0.78% higher at 36,548.41 points, its highest close ever, while Nifty closed 0.68% higher at 11,023.20, its highest close since 31 January. Veteran emerging markets investor Mark Mobius has warned that a trade war is just a warm-up act for a financial crisis, in an interview with Bloomberg on Wednesday. “There’s no question we’ll see a financial crisis sooner or later because we must remember we’re coming off from a period of cheap money," Mobius told Bloomberg. “There’s going to be a real squeeze for many of these companies that depended upon cheap money to keep on going." Foreign institutional investors have been net buyers of Indian shares only in January and March this year. Year to date, they have been net sellers of Indian shares to the tune of around $900 million. The market this year has been supported by inflows from domestic institutional investors (DIIs) who have been net buyers of Indian shares for each month this year, with net of more than ₹ 66,000 crore being pumped into Indian shares. Inflows into mutual funds have also been slowing down, with market volatility discouraging new investors. Net equity inflows fell by 18.8% to ₹ 10,623.30 crore in June because of rising oil prices and global trade war fears, data from Association of Mutual Funds of India showed. The only silver lining is hopes of faster earnings growth in the June quarter. Listed companies, barring telecom firms and select banks, are expected to post decent earnings growth in the June quarter, helped by rising consumption and the low base of last year, said brokerages. The weakening rupee has helped exporters as well. Edelweiss Securities expects the members of the Nifty index to post a 22% year-on-year profit growth in the June quarter. Motilal Oswal Securities Ltd expects Nifty and companies in its coverage universe to post a profit growth of 26%. Market performance, however, showed that while large cap stocks performed relatively better, the smaller ones have been hammered. 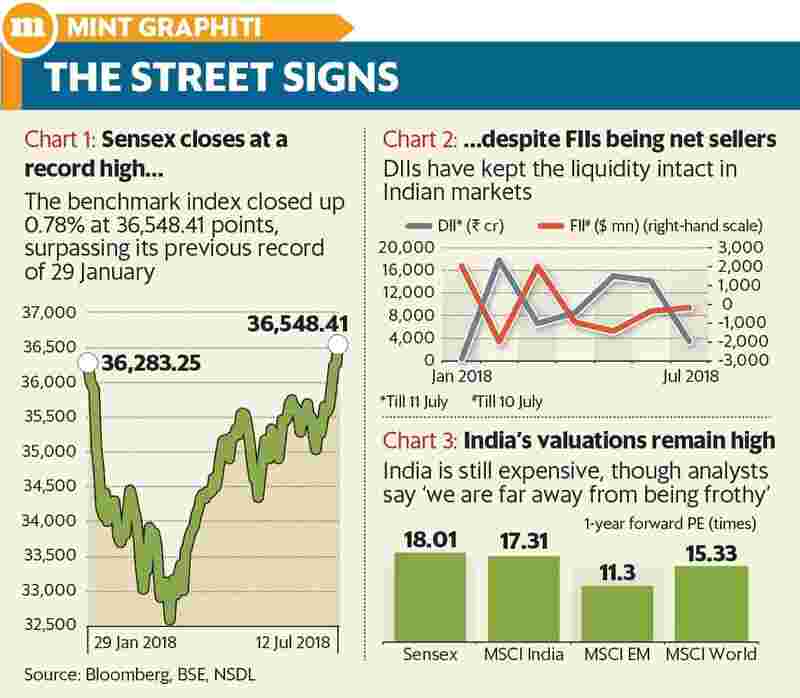 “It would not be right to say market is rallying because while Sensex rallied, mid-cap and small caps have been battered," said Anand Shah, deputy CEO and head of investments at BNP Paribas Asset Management India Pvt. Ltd.
“Market is rising on expectations of an earnings recovery after four years of low earnings growth," said Shah. Between Sensex’s previous record high on 29 January and now, mid-cap and small-cap indices were hammered the most. BSE mid-cap and small-cap index shed 12.19% and 14.16%, respectively. Only three sectoral indices logged gains—the BSE Information Technology index, BSE Fast Moving Consumer Goods index and BSE Teck index. Kotak Mahindra Bank Ltd, Hindustan Unilever Ltd, TCS, Mahindra & Mahindra Ltd and Asian Paints Ltd were the top five gainers in the period. “When we see concentration of rally, we see it is largely chasing quality," said Shah of BNP Paribas. “It is not a bull market. It is a message to investors that even though macro is challenged, it is not like 2013. Micro parameters will improve from here on," Shah added.